The Northwest Cherry Growers from Washington State sent me a box of cherries. They were so delicious, I almost ate them all without preserving a single one, but I managed to set aside some for these delicious projects. Cherry Bounce. It’s a delicious cordial, George Washington’s fave tipple! It’s delicious and takes about 15 minutes to stir together and then a world of patience while it does its thing for weeks. Make it before the cherry season is gone and you’ll be serving it this fall. 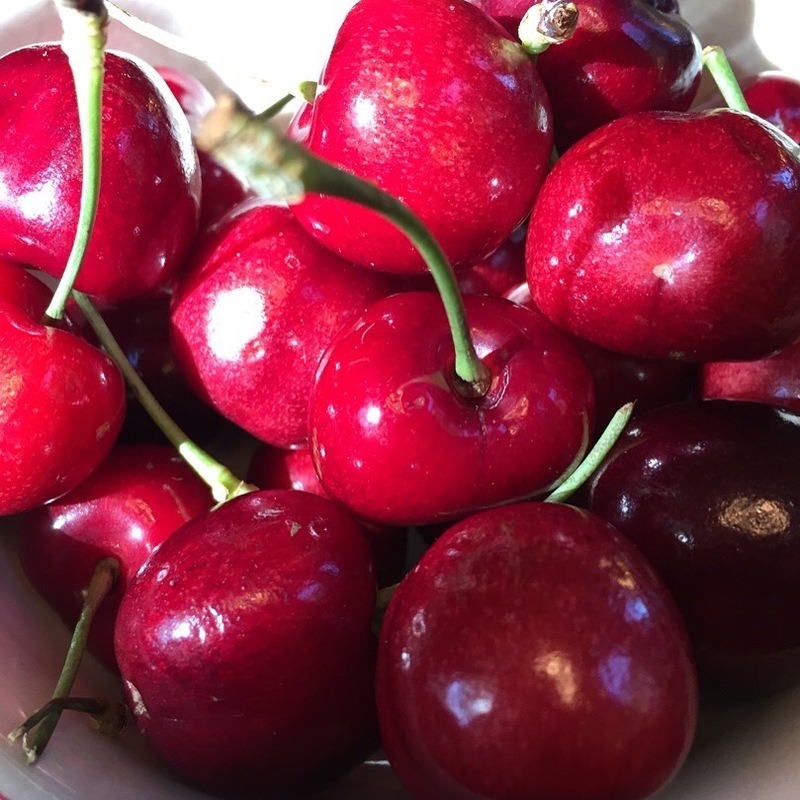 With all those gorgeous cherries, I turned to my good friend Domenica Marchetti’s lovely new book – PRESERVING ITALY – chock full of so many sensational recipes. 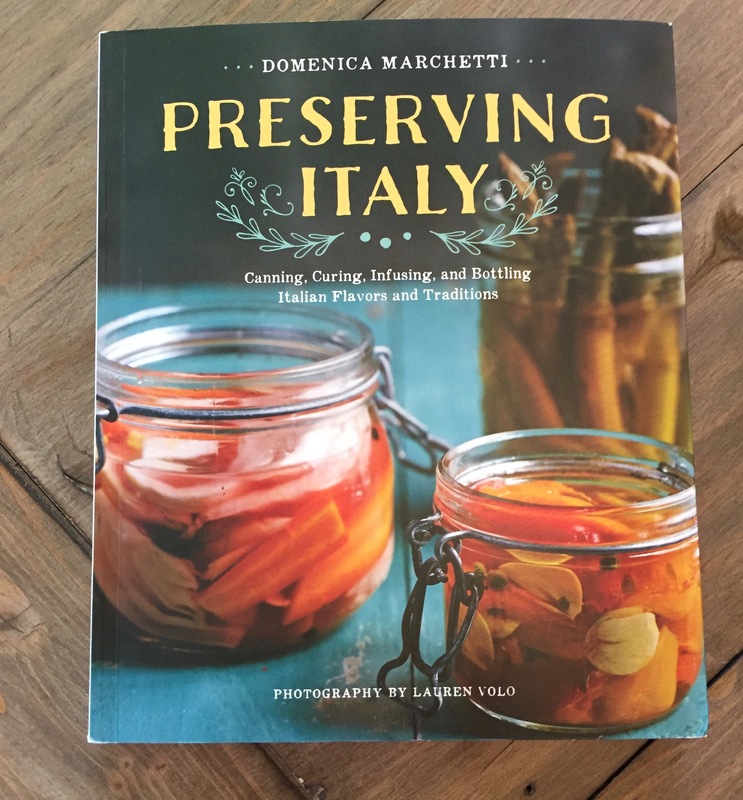 It is a joy to read, Domenica’s writing is encouraging and fun, and the fabulous assortment of sweet and savory preserved foods are incredibly appealing. Throughout this charming book, are warm, generous stories of her family that make you want to spend the afternoon in her kitchen. The introduction hints at one of Domenica’s favorite recipes – Sour Cherries in Boozy Syrup – that uses a fascinating technique of partially drying the fruit in a very low oven (or the sun) before soaking in sugar to create a syrup and then dousing in booze. I think, when they’re done, these will be the closest to my favorite Italian import cherries, so I’m excited. Before the season slipped by, I put up a few jars of my favorite sour cherry jam. I created this recipe two years ago, after the book was finished and I’m so happy to finally share it with all of you. 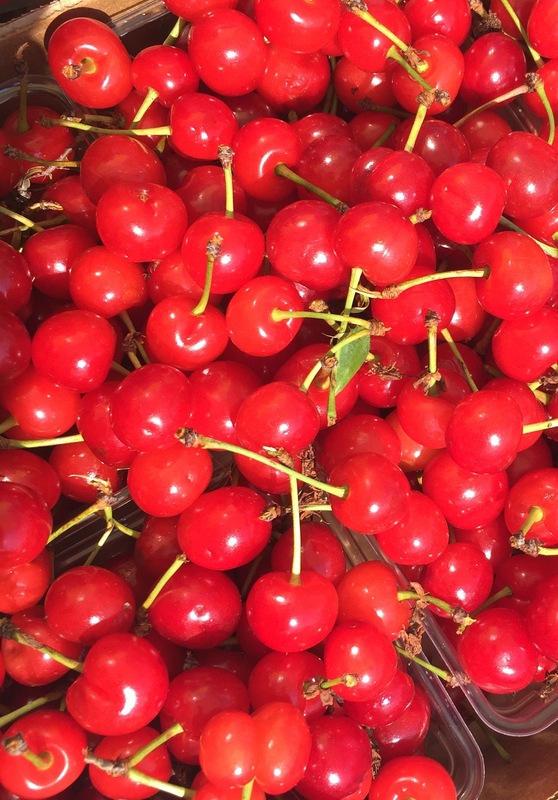 Sour (tart) cherries have almost no natural pectin. I rely on Ball Classic Pectin or my own Gooseberry Pectin to gel the jam. Start a large pot of boiling water for the canner at the same time you begin the jam making. If it comes to a boil before you are ready, turn the heat down and hold the water bath until the jam jars are filled. Add the sugar all at once and stir well. Adjust the heat to medium or medium high, stirring all the time to avoid scorching. Bring back to a full, rolling boil. Cook at a hard boil for one full minute. The foam will have receded. Turn the heat off and wait 2 to 3 minutes. The jam should have begun to set and will wrinkle when you push against the surface. If it is still loose, turn the heat back on and continue to boil hard for one more minute. Check again. When satisfied, add the butter and the liqueur and stir well. The butter will help clear the last bits of foam. Ladle the jam into the jars, wipe the rims carefully and place the lids and rings. Process the jars for 10 minutes. Use the jam within 12 months. Friday, 5pm Congratulations, Rebecca! You’ve won a copy of Preserving Italy. Cherry pie for heaven’s sakes. Cherry pies, cherry preserves, cherry pancake syrup. And I eat plenty too. They are especially good this year. Cherry pie is my favorite! Well, I eat them, of course – organic only, tho. Cherries were m virgin canning experience. With my infant daughter in a backpack, I pitted each one [so painful], cooked and canned. Haven’t made cherry preserves since. I would if I can find a functional way to pit them. I only remember how wonderful it tasted. Cherry crisp! But that Sour Cherry Jam looks like it is worth trying. 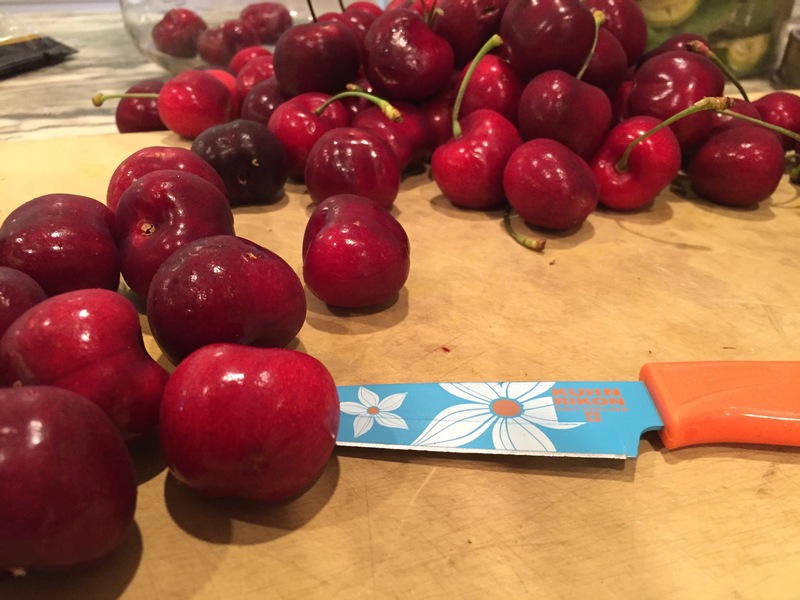 Do you think sour cherries have enough bite to make a “cherry-cello,” like a cherry flavored limoncello? Worth trying, Chip! Make sure to pierce the cherries and leave the pits in place. That recipe looks divine and I’ve been looking for something like that when the cherries finally arrive here in New England, so thanks for that. Normally I just make clafoutis and eat ridiculous quantities out of hand but I’m determined to do a better job of preserving them this year. Seriously, I still think about your cherry pie filling from the can-o-Rama! I’m in NY and Berks this week, hope there are cherries left when I get back! My favorite thing with sour cherries is cherry orange marmalade. 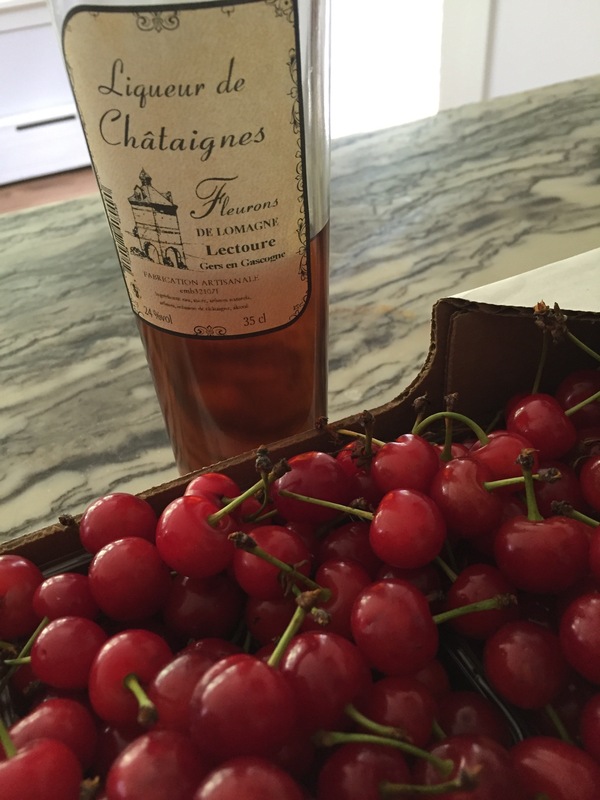 My favorite thing with sweet cherries is clafoutis – pits still in. Mmmm. Cherry Pie! I canned sour cherry pie filling from your book and we enjoyed a pie at Christmas, in February and the week we picked this year’s sour cherries! Just. So. Good! Cherry pie filling is a must! So glad you liked my recipe! Next to a perfect summer peach, cherries are my favorite!I pit them and make Cherries Jubilee! My father took me to a fancy restaurant when I was about 8 or 9 – just the two of us. I even remember the dress I wore! We had Cherries Jubilee for dessert (of course, we were told that the alcohol burned off, which it probably did). Been a fave of mine since. I would just adore a copy of Domenica’s book; I have all her others. And I have yours, too! Still remember that summer day two years ago making pasta with you and Domenica at a class in your kitchen. Well my childhood memories of picking sour cherries that were .10 cents per pound in 1960 in the Pocono Mtns of Pa. Us kids picked eat and held our stomachs all the way home too much of a good thing. We washed them and my dad put them in 5 gallon glass jars with white sugar. In about a month or so the glass jar filled with water attached to the mouth of the 5 gallon jug that was plugged with a copper pipe out of the plug to keep bugs out and wait for it to stop bubbling. We hab the best cherry juice until you dad fortified it with grain alcohol. His winter sipper. We bought two cherry trees this year! One actually gave us a few cherries by just enough to snack off the tree! I can’t wait to make jams when the trees grow more! When cherries are out, first I have to eat lots of them. I freeze some to use in smoothies, roast some and use for roasted cherry shortcakes, brandied cherries. I have a small basket of sour cherries that will become sour cherry syrup for sour cherry gin and tonics. Do you think the recipe would still work with a mix of sweet cherries? We’ll be going to pick our own at a farm this weekend, but I think it’s all sweet varietals. I think it would work perfectly with sweet cherries. Hi Rebecca, You’ve won the cookbook! Congratulations. Well, you’re officially my favorite person on the planet. Do me a favor and don’t mention that to my beloved spouse though. Oh, and my favorite thing to do with cherries is to pit them and mix with citrus juice and zest and pile into a crust to bake as a crostata. I always triple my pie crust recipe so I have extra to freeze and thaw as needed. Then summer dessert is a cinch. 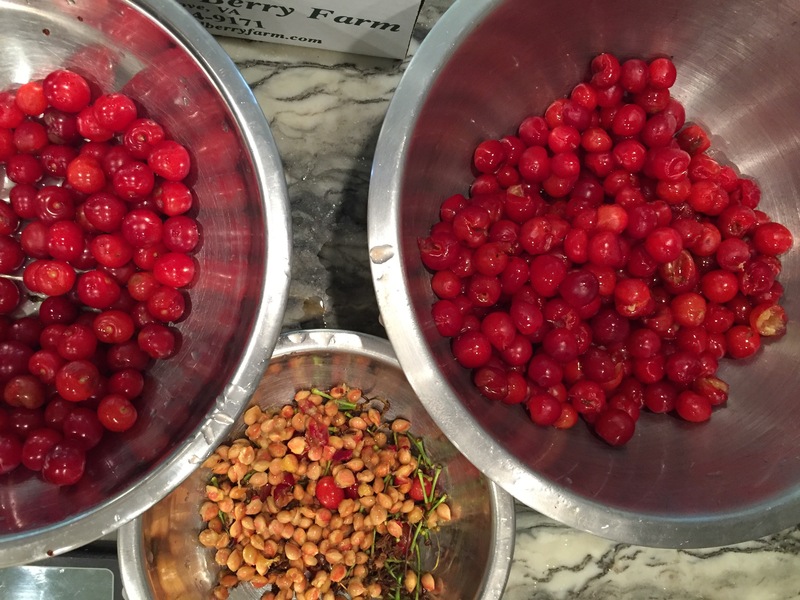 I love to make an old EAT NYC… Via Eli Zabar… vua Martha Stewart recipe for a thick, syrupy cherry sauce with a little cinnamon stick and fresh thyme (it’s wonderful!). Over a luscious cheesecake. Cherries! They are such a rare thing that I just eat them out of hand for the most part — although a nice yogurt cake with cherries sunk in the batter is not to be missed either. thanks for the giveaway opportunity! I have to confess, while I love sweet cherries out of hand, I’ve never been a fan of them once they’re cooked. However, I finally tracked down a local-ish orchard that has tart cherries, so I’m super excited to make my first batch of cherry jam. And pie, of course. And vareniki. Lots of vareniki. I love to put cherries in my smoothies. I make Cherry Clafoutis. In college I spent my junior year in the south of France (Montpellier) and lived with a host mother who was a wonderful, traditional cook. She worked full time and still managed to make a meal from scratch every night. She made this for me, and then taught me how to make it and it’s now a yearly tradition. So good. Sour cherry jam…..with roast duck please! I hVe never made anything with them because I eat them all up! I would make pie filling or jam/jelly. I think I’d make pie. Strawberry pie, probably. Or maybe blueberry-peach. There’s so many different pies to make with cherries! Kidding of course. Cherry pie is king! The world is a better place when there are cherries! Pie, preserves, syrups, ice cream and both fruit and savory salads. As for the book, please pick me. The local library gets upset when it finds my fingerprints on the pages of cookbooks! Duck with Cherry Sauce or eaten anywhere! As I live in WA cherry country I have to do something quickly or I’m blessed with too many cherries. Like George, I learned the Rumertopf version while my husband served in Germany. Use a clean jar or crock. For each pound of clean fruit placed in the jar add one cup of sugar. Cover all fruit with rum or vodka. The jar doesn’t have to be filled all at once and a mixture of fruit is lovely. Keep adding fruit, sugar and liquor until the jar is full. Let sit until the cold months arrive or until your sample tasting tells you its done and strain out the spent fruit. Cherry barbecue sauce – delish!!! I have made cherry jam, cherry pie and cherry cordial. But I want to try pickled cherries!! I bought 5 pounds of cherries on Monday and canned them Monday night. I just did it with a simple syrup but I am definitely going to go back out and buy more cherries and try the recipe you just gave us. Cherries are my favorite fruit and also my husband’s so anything I make with them will be treasured. Thank you for doing this. Cherry pie, cherry vodka, cherry syrup, cherry tarts, cherry scones. I love cherries! I will be making the cherry bounce as well as that lovely cherry chestnut jam recipe you posted! I’m very boring and make cherry dump cake with cherries or eat them as a snack. Oh just yum. I actually order Manhatten at this one restaurant only because they put a lucious brandy soaked Montmorency cherry in each drink. I even begged for an extra cherry. I would.love.love.love to learn how to make those cherries. I also adore recipes which preserve our late spring fruits (rhubarb & strawberries), followed by all the tree fruits plus other berries. Just picked apricots and a couple of strawberries for a tart. Ooo! Sour Dutch cherries from my old copy of Joy of Cooking! I let the Cardinals and jays have the sour cherries off my tree this year, so am making a fool of myself at the Greenbelt Farmers Market . . .
Domenica’s book sounds wonderful, and I can’t wait to be the winner and get my copy! I just eat them! But also cherry pie or cherry cobbler is fun to make and share. Would love to brandy some cherries and will try your cherries jam…Have them in the frig now! Thank you! Honestly, cherries rarely get past eating them fresh out of my hand. Lately though, I’ve been thinking of making a fresh sherry sauce for cakes & ice cream. Still in the initial phase of deciding the ingredients at this point. Homemade maraschino cherries for winter time cocktails. YUM. I love cherries, but I try to control myself because I must save some for the smoothies and jams during the winter season. This year I think I’m going to try some cherry liqueur. Thank. You so much for the giveaway. First it would be eat them. Then I would realize some must be preserved. I’d probably make a batch of cherry lime jam followed by brandied cherries and finish it off with a small batch of rhubarb and cherry preserves. We have a productive Montmorency cherry tree in our Colorado garden. It has reliably produced almost every year, even with our not very fruit tree friendly weather on the Front Range. I have jammed, frozen, pickled and frozen sour cherries, but nothing beats a fresh cherry pie! The boozy cherry recipe sounds like one I need to try this season! Cherry Pie. Cherry Pie. Cherry Pie. Cherry everything, pie, jam, sauce for pancakes, waffles, ice cream, in my homemade sangria, wine. We love cherries. Being from Wisconsin I make Brandied Cherries to add to a Wisco Brandy Old Fashion . Bing cherries can be used but we like Door County Montmorency tart cherries best. What do I normally do with cherries? I gobble them up before anyone else in the house! Pickled cherries for sure to eat with cheese and charcuterie, boozy cherries made with brandy, bourbon and a splash of amaretto for garnishing Manhattans later in the year and dehydrated cherries that I add after baking to granola made with olive oil and maple syrup. All lovely projects to share the bounty of an over-productive Seattle cherry tree. I would be so tickled to have a copy of this book! Soak some in booze and a pie with the rest. I ran away from home at five years of age for a neighbor’s sour cherry pie, or so my parents always told me. I’m afraid I grab all in sight at several Farmers’ Markets when they come into season, and enlist friends to do the same for me. I make Sour Cherry pie, claflouti, galettes and cobbler, and preserve them in liqueur, French style, and in traditional preserves. I’ll certainly try your recipe for jam this year. Fresh cherries with fresh frozen vanilla custard from the Dairy Godmother! Cherry pie is a close second. Normally I just eat them, but this recipe tells me I’ve surely been missing out on something! I’d like to try preserving sour cherries (short season where I live) — jams and chutney are my top choices. Have you used Pomona’s Pectin for your jams? Would you know how much of that pectin to use for your sour-cherry jam recipe that you post here? Thanks! I haven’t tried it with Pomona Pectin, but I’m sure you could still add the nutty whiff from the liqueur. The fruit/sugar/pectin ratios will differ, as will the order in which they are added to the pot, so follow the package directions for the best results. Michigan Cherry Bounce. Many years ago, my sour cherry loving sister (from the south where there are no sour cherries) came for a visit. We went to a U-pick farm in SW Michigan and picked cherries to make pie filling and jam. Talking with the darling farmer’s wife, we learned about cherry bounce for the first time. Following her instructions carefully, we filled several Gallo wine jugs (gallons) with the cherries, sugar, and vodka. The bottles went into storage ~ as directed ~ until the holidays. One evening when my husband and I arrived home from the theatre, we received a call from my sister in Alabama Her guests had been sipping the cherry beverage all afternoon ~ and were at that point in the midst of a pit spitting contest. The men wanted us to tell them cherry bounce is nothing more than cherry water. We could not confirm that. It is to be served in cordial glasses, imho. What say you? I think the cherry bounce. I have infused vodka with rasperries from my garden an it was good. But i’do like to try the cherries with rum. Cherries have just come in season at my location so before I can decide what else to do with them, I have to eat my fill. Right now the plan is to put them in a bowl next to me and eat them slowly as I sit and read on my porch! Cherry cobbler. I always mean to preserve some, but the lure of cobbler is just too strong. I love to pick tart cherries. The cherries are so, so lovely hanging from their trees in the sunshine. They almost glow. Cherries are best eaten fresh but if one has a bounty of them a nice pie or cobbler is wonderful. One of these would be great for the 4th of July. For the first time since moving to the Pacific Northwest, I was able to source sour cherries this year (we have sweet ones in spades!). I am making sour cherry pie to celebrate Canada Day and a batch of your cherry pie filling to enjoy in the colder months, but I think that I will also have to make your cherry chestnut jam in today’s post. Sounds incredible! I make my own maraschino cherries for cocktail hour. And eat them out of hand by the fistful. Pickled sour cherries – yum! And I make and can tart cherry pie filling to give to friends who can bake . Place tasting till to your liking..maybe two weeks if you can wait so long.